For additional information about this book, visit the website www.taleoftwosoldiers.com. On December 18, 1944, a twenty-one-year-old American soldier named Max Gendelman was captured by the Germans during the greatest battle ever fought in any American war—the Battle of the Bulge. He was one of only a handful of men in his company to survive, witnessing unimaginable horrors at the hands of the Germans. Taken prisoner, he and a small group of other soldiers were marched through German villages and taken to the location where he would spend the next several months of his life, each day wondering if it would be his last. Max Gendelman perhaps had more reason than most to worry. Although born and raised in Milwaukee, Gendelman was a Jew. A Tale of Two Soldiers is not simply a tale of surviving the atrocities of war. While imprisoned in the POW camp, a chance meeting with a lieutenant in the German Luftwaffe changed the course of Max’s life. Karl Kirschner, conscripted against his will, spoke to Max one day through the prison camp fence, and the two young men discovered a shared passion for chess. During clandestine chess games, they also shared conversation, learning about each other and their families, and they ultimately came to a decision: they would help each other escape. Max Gendelman’s poignant memoir, which he completed just one month before his death in June 2012, is a striking depiction of the worst of man’s inhumanity to man, but even more, it is an inspiring, heartwarming, and uplifting tribute to an unlikely friendship that endured for more than six decades. 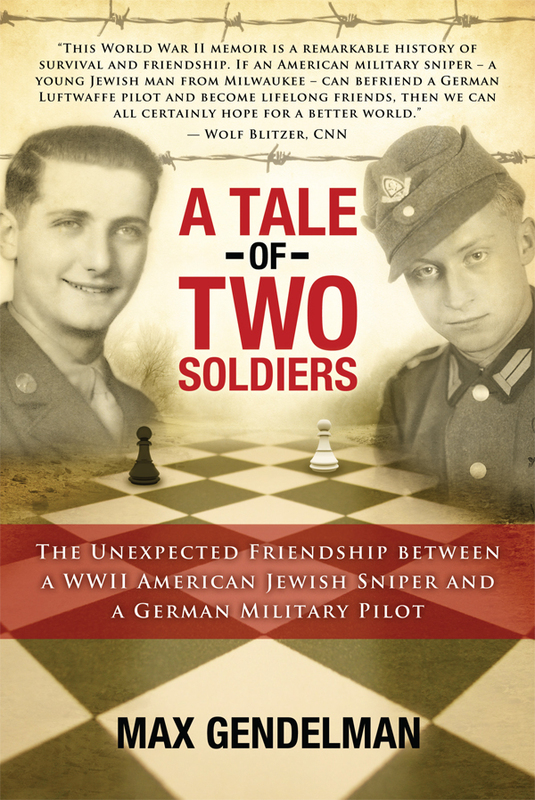 Max Gendelman was an extraordinary man, and A Tale of Two Soldiers is an extraordinary book. Gendelman’s words will stay with you long after you have turned the last page. A young Jewish G.I. taken prisoner in the Battle of the Bulge witnessed horrific images that left him shell-shocked. For sixty years Max Gendelman avoided painful memories by nurturing his family, business, and a lifelong friendship with the German Luftwaffe pilot who helped him escape. He received the Purple Heart and was named by the French Republic “Chevalier of The Legion Of Honor.” He died in June 2012, one month after he finished A Tale of Two Soldiers; he was buried with military honors.